This is another item that was in my swap package (remember how I wrote about I swapped with Jess of Blogger Fae Glasgae?). 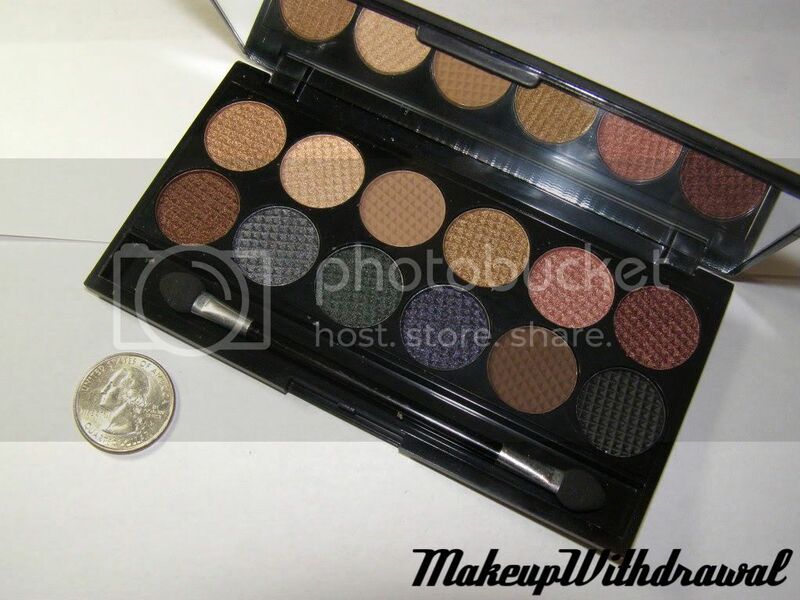 Sleek palettes get a lot of love on MakeupAlley, but for the last year, I didn't give them a second glance because... their waffling patterns aren't aligned. Take a closer look at the picture to the left to see what I mean. Isn't it absurd that this was my only objection, the only thing holding me back? Yes, I know- but I'm picky about packaging and product orientation like that- when ever I saw a picture of a Sleek palette, I wanted to rip out the shadows and glue them back in properly. 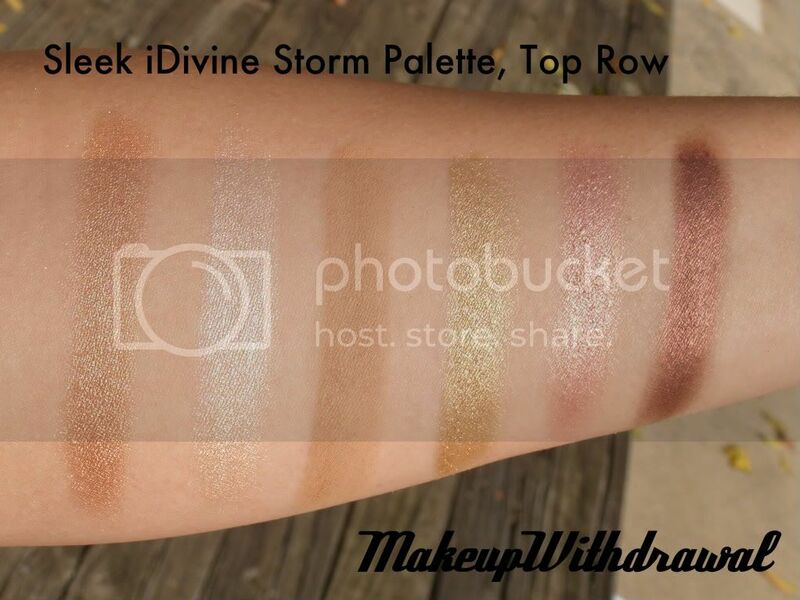 Well I finally got over my stupid reason for not getting a Sleek iDivine palette, and am I glad that I did! Each palette contains 12 shadows about the size of a nickle, a mirror built into the case and a long, double ended, sponge tip applicator. I picked Storm because it contained a lot of shades that I like- dark jewel tones with some neutrals. The pigmentation is incredible in these palettes! 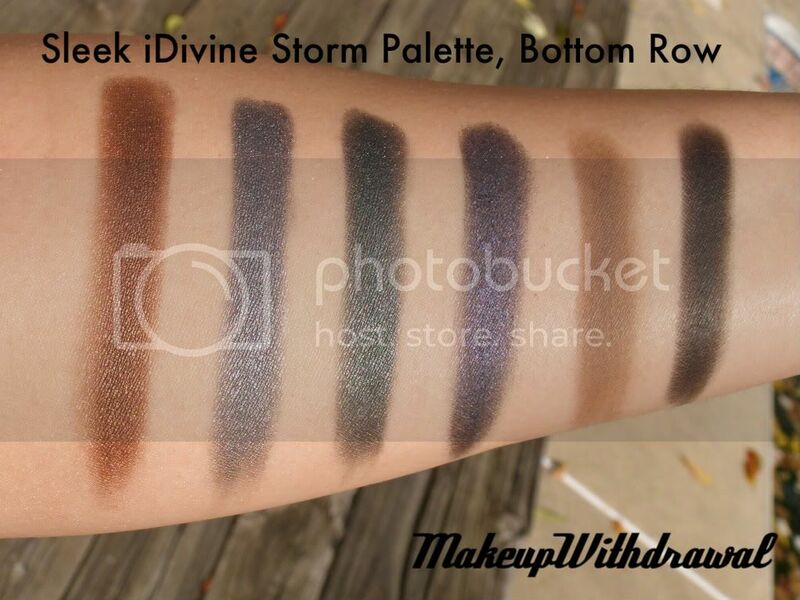 There's three matte shades and all the rest are high frost/metallic, and every shadow in Storm is super rich in color. As always, click to enlarge! Everything is swatched over bare skin because the pigmentation is nice enough that I didn't feel the need to do it over primer. Top Row (warm colors), left to right: a soft metallic golden beige, a frosty vanilla, a matte medium beige, a metallic yellow gold, a frosty pink and a metallic burgundy. Bottom Row (cool colors), left to right: a coppery metallic brown, a metallic blue-charcoal, a dark metallic green, a metallic blackened indigo, a matte medium brown and a matte black. You could do so many looks with this palette, my mind can't even fathom all the capabilities. The only problem I'd have with this palette is that the metallic shades can get a little crumbly when applying- especially with loose fluffy eyeshadow brushes. I really have to use a patting motion with these shadows to keep fallout from dusting my cheeks. Using the applicators helps too. But, for $10 (US dollars) I'm not really complaining too loudly. People who aren't super fond of high frost might not want this palette- that's kind of the appeal of Storm, mixed in with a few essential matte shades. For that sort of folk, I'd suggest another Sleek palette instead- that's the great thing about them- there's many to choose from! Do you have any Sleek Palettes? What do you think of them? Product was swapped for in an even exchange.